William Wadsworth was an American Founder on the New York frontier. Wadsworth played a role in treating with Native Americans as well as the early stages of the War of 1812. William Wadsworth was born into a prominent family in Connecticut. Many Wadsworths played a large role in the Revolutionary War and creation of the National Government. William, along with his brother Jeremiah, decided to make their life on the frontier. They moved to Western New York where they founded a town they called Big Tree. From this town, now known as Geneseo, the brothers began settling the wildest parts of the State. William lived in a log cabin. This cabin became the headquarters of development on the New York frontier. Any travelers who came through the area were invited to stay with the brothers. This included The Duke of La Rochefoucauld. The Duke was a French nobleman who escaped the Reign of Terror and was taking a tour of the United States. The Duke’s note tells us that the little log cabin was a stinky place, where the men lived together with their chickens. By 1797, William had built a new home. This residence was an early cobblestone building. Cobblestone, which used stone and mortar to construct the frame of a house, would become an important part of architecture in the area. Although it spread as far west as Wisconsin, it has been estimated that 90% of all cobblestone houses in America are within a 75 mile radius of Rochester, NY (about 60 miles north of Big Tree). This means Wadsworth had a major, albeit seemingly accident, contribution to a small segment of American Architecture. William Wadsworth had spent many years as Town Supervisor in his quickly growing community. Additionally, he was a leader of the Militia. When the Madison Administration declared war on Great Britain and the War of 1812 began, Wadsworth was appointed Brigadier General in the New York Militia by the State Governor. He was tasked with defending Western New York but was also given permission to act aggressively if he saw fit. It was in this position that he decided to attack Canada. Wadsworth joined forces with Lieutenant Colonel Winfield Scott. Scott would go on later in life to be Commanding General of the United States Army through the administrations of seven Presidents. Wadsworth technically outranked Scott, however, he had little field experience. Correctly seeing the potential in Scott, he differed command to his inferior officer. They crossed the Niagara River and made some headway early on, attacking Queenston Heights, but the British pushed them back. Trapped and without reinforcements coming (hundreds of Militia soldiers refused to cross the River and William swore at them enough to be considered ‘the most eloquently profane officer in the army) the Brigadier General surrendered. Wadsworth was released shortly after and retired to the hometown he built himself, living peacefully for another twenty years. To read more about Founders on the New York Frontier, check out my articles on Samuel Kirkland and Simeon De Witt. William Wadsworth does not have a biography to speak of but I’d like to recommend a book about Cornplanter who attended the Treaty of Big Tree. 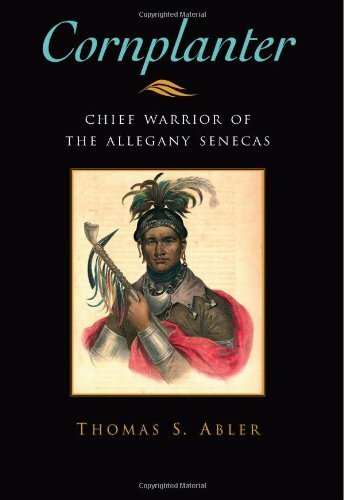 ‘Chief Warrior of the Allegany Senecas’ is about someone who technically was against the Americans during the Revolution but is an important figure to know about nonetheless. Pick up a copy of the book through the affiliate link below. Please consider subscribing to my email list for a new Founder every morning.